Six ex-employees of Heckler & Koch have gone on trial in Stuttgart for selling assault rifles to Mexico. Activists held a vigil outside the court for victims of those believed to be killed by the German gun-maker’s arms. It took eight years for the proceedings to make it this far, but on Tuesday the German state’s case against the country’s most infamous gun-maker — which also supplies small arms to many NATO countries — was finally brought to trial. Six former employees of Heckler & Koch stood accused of violating Germany’s War Weapons Control Act and its Foreign Trade Act by selling thousands of G36 assault rifles to Mexico — while knowing full well that they would be used in four violence-ridden Mexican states. In the end, there were only five former employees present in Stuttgart, as one of the defendants, Markus B., who lives in Mexico City, did not appear in court on the grounds that his poor health forbids long-haul flights. Judge Frank Maurer decided then to separate his trial from this one — but, being a Mexican citizen, it seems unlikely that Markus B. will ever face a German court. The man who initiated the case by pressing the charges in 2010, veteran German anti-arms-trade activist Jürgen Grässlin, was sitting among the spectators in court. Earlier on Tuesday, he delivered an angry speech outside at a vigil for the victims of the 2014 massacre in Iguala, in the Mexican state of Guerrero, in which 43 teaching students vanished at the hands of corrupt police and are feared dead. Some of these students, German and Mexican researchers have concluded, were very likely killed with illegally imported H&K guns. Human rights activists in Mexico believe police turned the students over to the mafia organization Guerreros Unidos, who murdered them and disposed of the bodies. Only the remains of one student have ever been definitively identified. 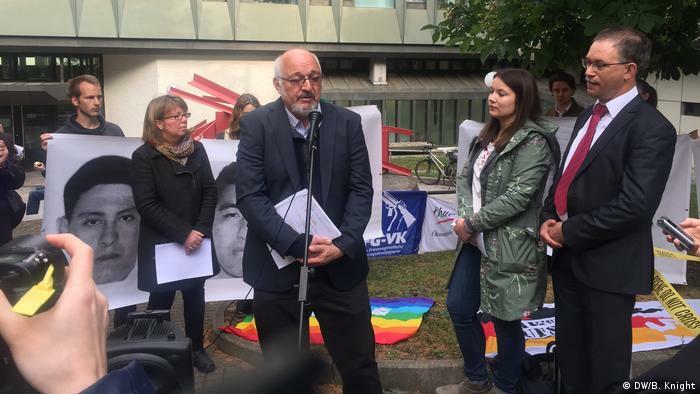 To the disappointment of Carola Hausotter, who gathered research in Mexico ahead of the trial for the German Human Rights Coordination in Mexico organization, relatives of those dead students are not allowed to testify as witnesses in the proceedings. “The families are taking this trial very seriously, especially because they are expecting more justice from the German system,” she told DW. But Grässlin had other reasons to be dissatisfied with the trial. In 2016, his attorney Holger Rothbauer pressed charges against officials in the German Economy Ministry and the government’s export control office BAFA for helping H&K make the deals. But state prosecutors decided not to pursue the investigation, and the statute of limitations on the alleged crimes has since elapsed. Grässlin even argued that, since all arms deals are ultimately decided by the National Security Council (BSR), a committee of senior ministers headed by Chancellor Angela Merkel, the highest levels of the German government should themselves be investigated. On the first day of the trial, it became clear how the other defendants were plotting their defense: Deflect responsibility to government authorities (knowing that they had been effectively disburdened of legal trouble by the Stuttgart DA), or to a previous H&K sales director Axel Haas, who died in 2015, or onto each other. Nevertheless, two former CEOs did appear in court — with one defendant attracting particular attention: Peter B. — a former president of a district court in Rottweil. Rothbauer and others have suggested that prosecutors slowed the investigation to protect a legal colleague — speculation that the judge dismissed on Tuesday. “Well, I have no choice but to believe him,” Rothbauer said afterwards. Peter B. read a statement to the court, arguing that he hadn’t been responsible for approving arms deals at the time in question. “Everything has become focused on me,” he said, before suggesting that his early tasks, as “official correspondent” for H&K, amounted to acting as a “courier service” between government ministries and the gun-maker. Judge Frank Maurer underlined during the trial that the case was extraordinarily complex, both legally and in terms of establishing the facts. More than 20 more trial days have already been planned up to the end of October.